Hailsham Town have confirmed Paul Turner as their new manager following the resignation of former boss Jamie Salvidge. Turner, 36, has been around the county league scene all his adult life and was most recently assistant to Salvidge after stepping up when Kenny McCreadie left for Langney Wanderers a few weeks ago. Turner revealed he was offered the chance to follow McCreadie to Langney but chose to remain loyal to Salvidge and the Stringers and he has now been rewarded for his loyalty with his first manager’s position. It is clear that the appointment is a very bitter sweet moment for Turner. “I am Hailsham born and bred, I could probably run to the ground and back,” he said. “I started at Hailsham youth and Hailsham United, so I am the same age as some of the older players that are still here now and then I went to Hastings, Eastbourne United and then Crowborough for three years where we went from division three to division one and then finished off my playing career back at Hailsham. Then I’ve been an assistant to Kenny at Bexhill and Langney Wanderers for his first stint there. Tuner insists he is confident that his players will stay but was reluctant to rule out any departures following Salvidge’s resignation. Salvidge himself has agreed to stay on as a player for at least the remainder of the current season. What turned out to be his final game in charge ended in a 3-2 defeat at Steyning Town this past Saturday. First-half goals from captain Ashley Jarvis and Liam Baitup put the Stringers two goals ahead at the break but an impressive second-half comeback from promotion chasing Steyning saw them score 3 second-half goals to steal all three points. “We started well, and completely controlled the midfield but the second-half they turned it around. We could’ve nicked a draw when Charlie Playford hit the bar with a header at the end, but it wasn’t to be,” said Turner. 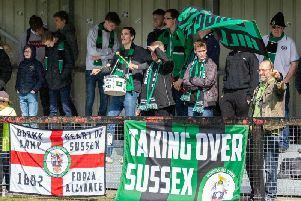 “I think the top three will be Bexhill, Steyning and AFC Varndeanians, but we can beat anyone on our day and I want to try and get promoted but getting into that top three will be tough. We still need to play the top sides home and away, so we’ll have a chance to close the gap over the coming weeks and months.